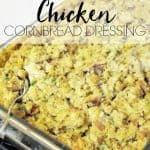 This traditional southern chicken cornbread dressing recipe combines cornbread, vegetables, seasoning, and of course, shredded chicken for that grandmother used to make, perfect side dish. 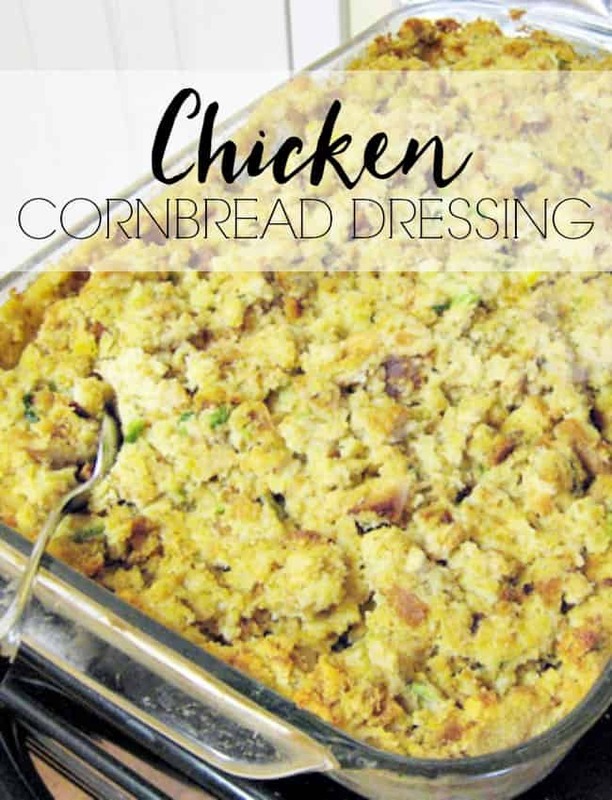 This chicken cornbread dressing is one of my favorite side dishes during the holidays. Although it doesn’t have to be just during the holidays, I could eat a bowl of it right now. If you are northern then I know what you are probably thinking. What the heck is dressing? It is what we southerners call stuffing. It is a lot like stuffing but well not stuffing. It is cooked on the outside of the bird in a dish. Just like I prefer it. haha! This is my mom’s recipe, passed down from her mom. During the holidays it is a lot to cook for a household of just 3 but it has become a tradition and a recipe that I remember having every Thanksgiving and one that I want to pass down to my own daughter as well. Boil your chicken legs in a large pot with plenty of water. You will need the broth as part of your ingredients. Once your chicken legs are cooked separate the meat from the bones. Pour your chicken broth into a 9x13 inch dish. Depending on how much water you used to boil your chicken you may not need all of your broth. You will want to fill your dish about half full of broth. Now you can add the rest of your ingredients, continuing to stir to get everything spread around. Add the chicken, 1 egg and cornbread. You should only need 1 skillet or 9x9 pan of cornbread for a 9x13 dish of dressing. Stir in the onion and celery. I chop these into little pieces using my food processor. Now you can add in the seasonings. Add salt, pepper, sage and poultry seasoning to taste. Make sure you go light on the sage and poultry seasoning at first and then you can add more if it needs it. I don't have exact measurements on how much I add but I would probably say somewhere around 1/2 tablespoon. Bake in the middle of the oven for approximately 1 hour. Stir the dressing every 20-30 minutes. Before you get started even making the recipe above you will want to cook your cornbread. If you already have a recipe for regular skillet cornbread then you can definitely use that but if you don’t then here is how I cook my cornbread. Warm your pan/skillet for 1 minute in the oven. Pour over mixed ingredients into hot pan/skillet. Cook for 20-25 minutes, until golden brown. It is important to note that you don’t want to go to heavy on the sage or poultry seasoning. You can always add more but you can’t take away if you add too much. If you don’t like this herb then you can leave it out all together but I feel like it adds to the taste. Once you get everything into your 9×13 casserole dish the final mixture will be wet. It is supposed to be like this. You don’t want it too wet so if that is the case then you need to add more cornbread. You can also switch it around and crumble up the dry ingredients in the pan and then add the liquid to it. This will allow you to get just the right amount of wet to dry ratio. Just be sure that you don’t add too much cornbread otherwise you will be eating dry dressing. If that does happen (no worries it has happened to me too and I have cooked this so many times) you can make you up a little bit of a thickening with flour and water and then add some of the leftover broth to the mixture. Allow it to warm on the stove and it will make a great gravy. That is just about all there is to it. Let me know if you cook a dish of this dressing or if you are like myself and had this (or something similar) as a child.